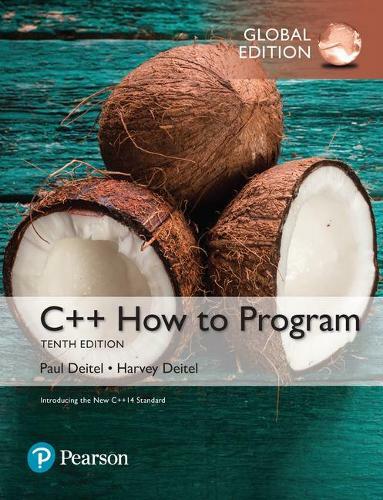 The best-selling C++ How to Program is accessible to readers with little or no programming experience, yet comprehensive enough for the professional programmer. The Deitels' signature live-code approach presents the concepts in the context of full working programs followed by sample executions. The early objects approach gets readers thinking about objects immediately-allowing them to more thoroughly master the concepts. Emphasis is placed on achieving program clarity and building well-engineered software. Interesting, entertaining, and challenging exercises encourage students to make a difference and use computers and the Internet to work on problems. To keep readers up-to-date with leading-edge computing technologies, the Tenth Edition conforms to the C++11 standard and the new C++14 standard. This package includes MyProgrammingLab, an online learning system designed to engage students and improve results. MyProgrammingLab consists of a set of programming exercises correlated to the programming concepts in this book. Through hundreds of practice problems, the system automatically detects errors in the logic and syntax of their code submissions and offers targeted hints that enable students to figure out what went wrong-and why. MyProgrammingLab should only be purchased when required by an instructor. Please be sure you have the correct ISBN and Course ID. Instructors, contact your Pearson representative for more information.